One lucky winner will be selected to GO GRAND in Grand Prairie, Texas! Epic Waters Indoor Waterpark – A Cabana Package Rental for 8!Includes Full Day Admission, 3 Large Pizza’s, 3 Pitchers of Cola & (8) $15 Arcade Cards, plus the Cabana Rental! (1) Complimentary Night Stay at the LaQuinta Inn & Suites Dallas Grand Prairie South. The winner of the prize is randomly selected and the odds of winning will vary depending upon the number of contestants. Total Approximate Retail Value (ARV) is a (GRAND) $1,000.00. A leader in Texas tourism, Grand Prairie’s various entertainment venues attract more than 11 million visitors a year to the city. Grand Prairie is all about family fun and is home to Lone Star Park, IKEA, Epic Waters, Ripley’s Believe It or Not!, Louis Tussaud’s Palace of Wax & Ripley’s 7D Moving Theater, Traders Village, Texas Airhogs, The Theatre at Grand Prairie, Grand Prairie Premium Outlets, Asia Times Square, Uptown Theater, Joe Pool Lake and more! 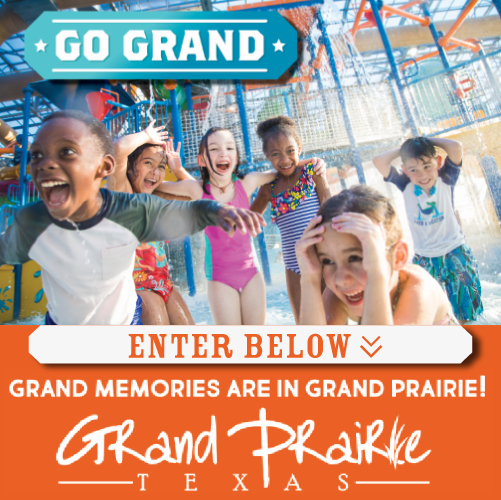 For More Info, check out visitgrandprairietx.comor call 800-288-8FUN! Follow our Facebook page to hear the winners announced after each contest! Please note that by submitting this form you are entering the contest and providing your information to us and our sponsor for Texas travel planning purposes.